For data-driven businesses, cloud can be a boon. 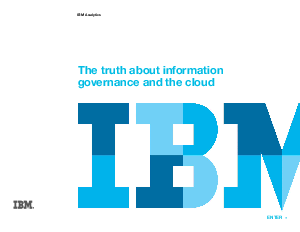 Data can be found, processed and managed on the cloud without an investment in local hardware infrastructure, but what does that mean to information trust and governance? When data comes from cloud-based sources, IT needs a plan for data integration and security. Download this insightful white paper and learn the four key priorities you must consider when developing your IT strategy to promote good hybrid information governance. Learn the blend of process, organizational and technical enablers that will allow you to move to a hybrid environment with speed and confidence.